We work hard to provide our customers with the best quality products from trusted manufacturers. We continue to add new products and lines regularly. If you don't find a product on our site that you are looking for, please contact us and we will source it for you! 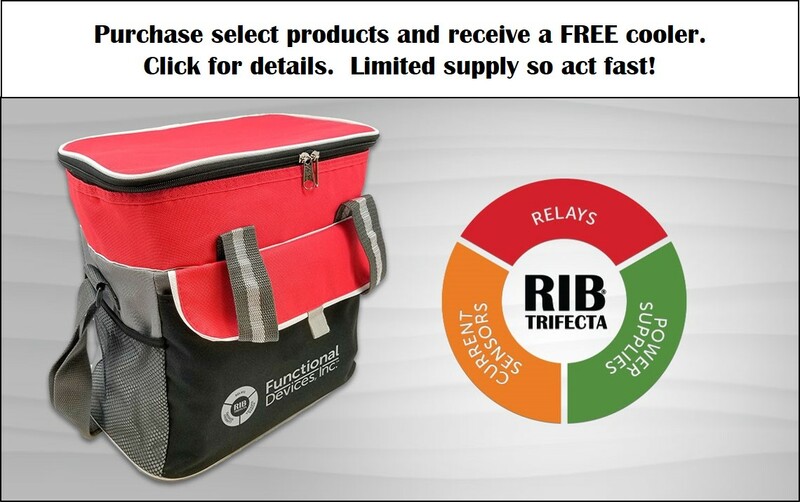 FREE RIB Cooler Bag Offer! Purchase the total quantity of any of the selected products listed below and we will send you a FREE RIB cooler bag! *One cooler bag per order. Limited quantities available. Cooler color and design may not be exactly as shown in picture. Cannot be combined with any other specials or products. Online orders only. Offer expires Aug 31 2018. Honeywell is pleased to announce the release of EagleAX Plant Controller, providing a Plant Controller running Niagara to the WEBs portfolio. WEB-EAGLEAX26 is a plant controller with 26 on-board Input-Output points which can be expanded up to 400 points using the panel-bus I/O modules. This plant controller is supported by WEBs-AX 3.8.u1 software. Although, this Controller supports Niagara and can act in a capacity as a Supervisory controller, it is best positioned as a plant controller due to its license capacity. EagleAX plant controller is supported by WEBs-AX-3.8.u1, with 26 on-board I/O points. Pre-licensed to 80 points, with 60 for panel-bus and 20 for network Niagara I/O points. Alarms, Schedules, Trends (Histories), Graphics/Schematics, Email. Replace aging expensive controllers to newer more economical controllers, while retaining all the I/O modules. Opportunity to integrate to a one BMS system based on Niagara framework. The EagleAX plant controller is only licensed for brand WEBs and is supported by the standard WEBs-AX workbench. Please refer to Getting started with EagleAX Plant Controller document, which can be downloaded from Honeywell Buildings Forum. NEW Light Commercial Building Solutions! Connect with your light commercial buildings customers like never before with Honeywell’s LCBS Connect™. It uses the Internet of Things and Big Data to make it easy for you to view, analyze and diagnose the operation of small and medium buildings from anywhere at anytime, so you can operate more efficiently by remotely diagnosing and analyzing problems. It’s a scalable, reliable and secure solution that helps you better serve your customers while spending less time in your truck. The Ideal Light to Mid-sized Commercial Building VAV Zoning System! The system that is taking over the zoning market! ProLon is an application-specific configurable control system entirely designed for retro-fit and modern day rooftops and air handling units along with their VAV zones. Developed by HVAC experts to bridge the gap between simple zoning panels and full-fledged DDC systems, ProLon’s lineup of controllers deliver incredibly high performance, bringing building automation technology to unprecedented levels of simplicity and accessibility. Remote access, FREE software, and email alerts are just a few highlights of this system. ProLon does not only offer zoning system solutions.